Maybe I would have called it League of Legends or Overwatch for example? I am obviously being a little facetious when I make those comparisons; however, I do have a reason to make the connections. 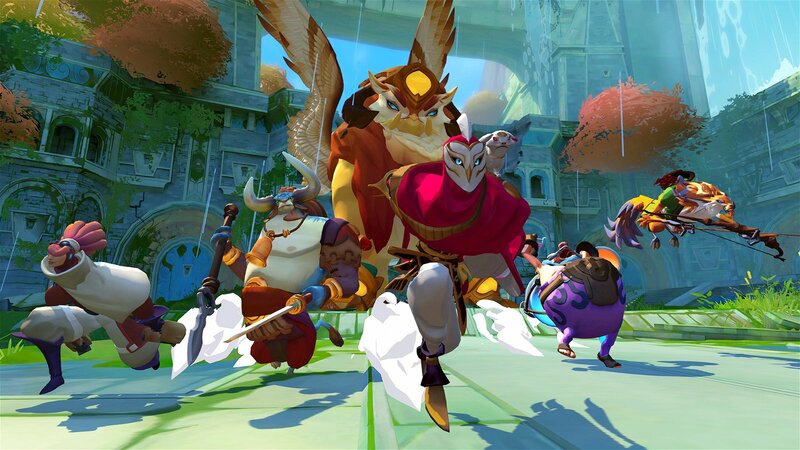 Gigantic wears its Overwatch inspiration on its sleeve, almost to the point that I could envision the meeting where the people of Motiga—the developer of Gigantic—were instructed by some businessman to make their game more like Overwatch because Overwatch sold really well. That’s why this game has a killer robot named HK-206 that is a BASTION of possibilities—like an alternate turret mode. There is a rapid firing, duel wielding, goggle wearing lady whose backpack lets her move so fast that it would be impossible to TRACE HER movements. A few League of Legends comparisons can be made as well when you realize that the term lanes is a concept used in both Gigantic and League of Legends. Also, the overall goal of a League of Legends match is to destroy the other team’s base, which is more or less what happens with the giants in Gigantic. 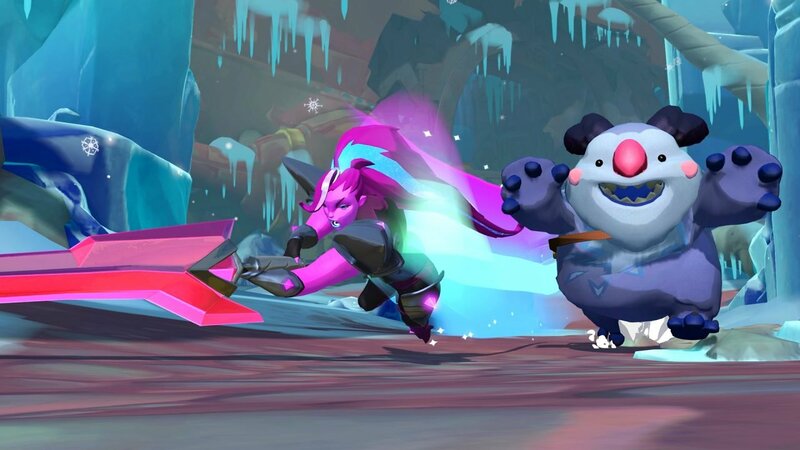 That’s not to say that Gigantic is a direct clone of Overwatch, League of Legends or any of the games that inspired Overwatch or League of Legends. They were showing Gigantic off two years ago at E3 2015, roughly a year before Overwatch came out. On top of that, if I was simply going to talk about inspiration, I could literally write about 90% of the games that were ever made; therefore, the point I’m trying to get across is that Gigantic is not a simple clone of other games. 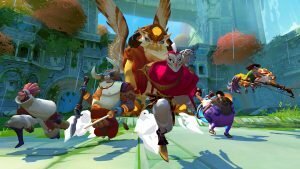 It’s just that you should go into Gigantic knowing that wears its inspiration proudly on its sleeve for all to see, and if you are a fan of games like Overwatch or League of Legends this might even be a good thing for you. If you like a game for a specific game-play reason, then you will probably like a game inspired by the source material as well. 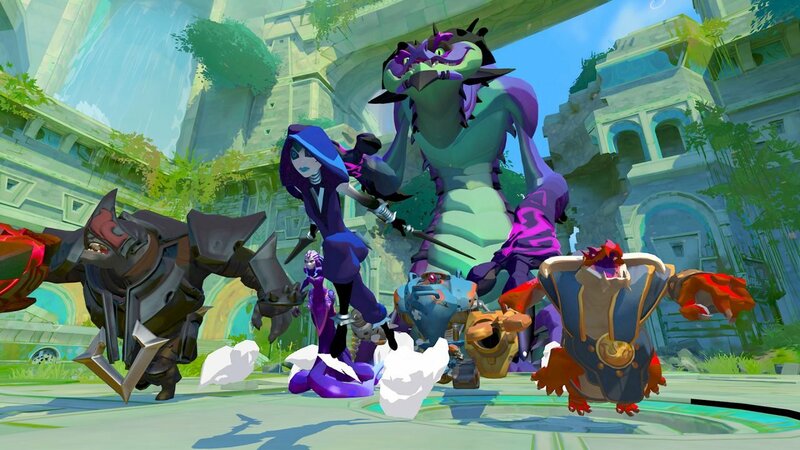 With the elephant in the room out of the way, we can now examine Gigantic on its own merits, and I am happy to say that there is some fun to be had here. Matches are fast-paced and full of moments that will make you scream with joy and/or frustration. The map designs are colourful and stylish enough to draw comparisons to games like Borderlands and Zelda: Windwaker. The voice acting and music are a little Spartan, but what the game offers is well done. The objectives required to win the game are simple, and this means you are not hindered by the fact that no one talks on Xbox Live anymore. Also, the nature of the gameplay means that if you enjoy the basic premise of the game, you should be able to get a lot of play time out of it before you get bored. The fundamental mechanics of the game feel very solid as well. The controls for the characters all feel accurate, and each hero has their own set of skills that balance well with four other randomly chosen heroes. Each map has multiple lanes that will suddenly force you together with the opposing team, with a number of little nooks for players to hide in. The online code is solid enough that I never had any issues with lag or server connections while reviewing the game. Gigantic even has a one button upgrade system. Every character earns points by doing things during the match, and those points can be exchanged for better damage, defence, and other boosts. If you wish, you can open a menu while inside the game to spend these points, or you can simply hold down the D-pad in order to have the game automatically assign you an upgrade. Yes, you don’t get to personalize your upgrades this way, but it allows you to spend your points without stopping the action. On top of that, I never really felt like the automatic upgrades were a poor use of my points. 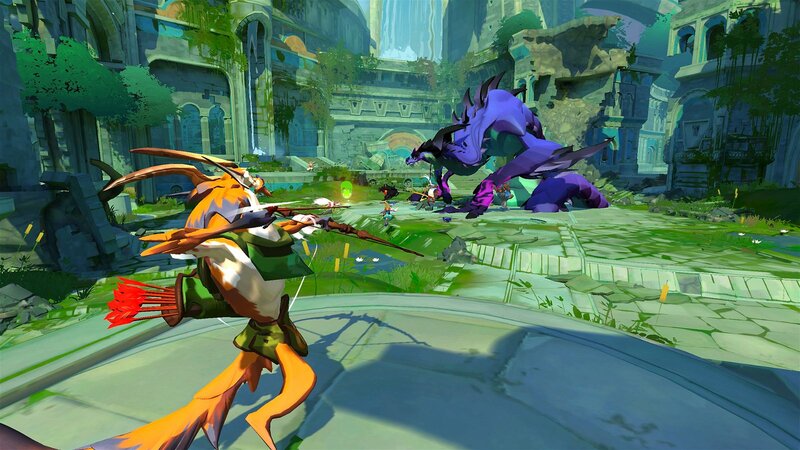 With all that said, if you are still looking for a reason to praise Gigantic, you can’t go wrong with the fact that you can play it for free; at least in theory. It might not be practical to go with the small selection of free characters you’re given each week as a free-to-play game. This is because you cannot take two of the same hero into any match of Gigantic; therefore, it is very common for you to show up in a server and find that all of the heroes you are good with are already taken. Not being able to play with a hero I’m good with is an issue I experienced on many occasions, and I had the full version of the game from the start. I can’t even imagine how hard it would be for someone who didn’t have constant access to any character that they were good at. It helps that each week’s allotment of heroes is different for every player, but you should go into this game knowing that you will never get to main anyone. Especially since the community heavily embraces Becket, Tripp, Tyto the Swift, The Margrave, Voden, HK-206, Charnok, and Zandora as their heroes of choice; and that’s probably because most of them are fully unlocked if you buy the $12 Start Bundle. Since these heroes usually make up the majority of each team every round, you’re going to have a bad week if your allotment of heroes mostly comprises these names. Your ability to play will certainly become a hindrance for you and your team in these situations—since each character has a learning curve, and there is no way of knowing which heroes are selected until just before the game starts. On top of that, if someone from your team disconnects somehow, or picks all the heroes you normally use, there is no way for you to get out of a match; so regardless of how unfair the situation is you are stuck with it until the game ends. The other major issues I have with Gigantic all revolve around the menu system. It is almost impossible to figure out what is going on with the menus until you are almost ten hours in. This is because there is no real tutorial for the menus, and I found that odd since there are great gameplay tutorials that explain how to play the game—in extreme detail. The menu hints I will give you include the fact that the tarot cards are actually gameplay objectives you can work towards for extra awards; therefore, only pick the generic cards or the cards for the characters that you are going to use. Never lose focus while searching for a match because you always have to confirm twice that you want to play before joining a game. Finally, you unlock the Gigantic mode after you play the tutorials and one offline bot match. 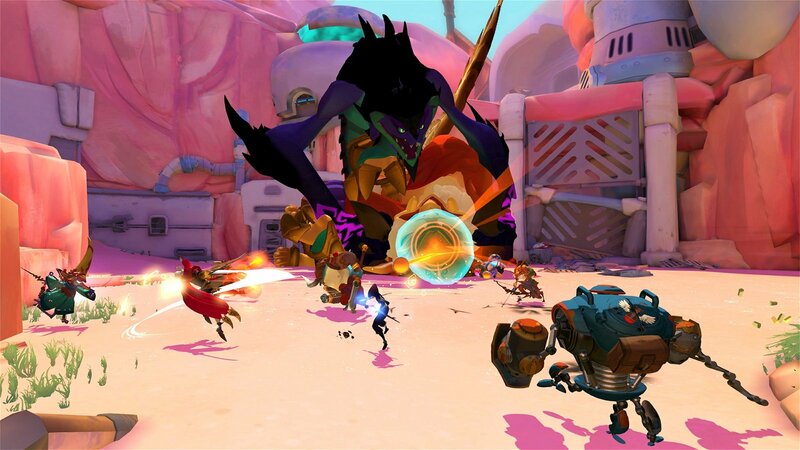 Personally, I think that Gigantic is a fun game with simple action mechanics that will allow you to play a Hero Shooter without needing to take a college course on the strategies, heroes, and maps. It labels itself as a free-to-play game, but due to design choices, you will really want full-time access to some characters—a $12 buy-in at the minimum. It also takes a lot of inspiration from Overwatch, but that’s not a huge issue since it does that and most things well. At least well enough for me to say that if you’ve ever wanted to play Overwatch then this might be a better choice. Overwatch is a hell of a game, but one with a community that is well practiced at the many mechanics required to play it. 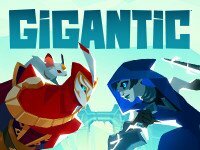 Gigantic is less focused on strategy with a fresher community, so you may want to consider Gigantic as a way to dip a toe into the world of hero shooters.